Downtown Historic Chitina, Alaska Mile 33 Edgerton Hwy. Chitina....close to the edge but still within reach of comfort! Locally owned and staffed. Alaskans sharing Alaska! Where the pavements ends…and the gateway to Wrangell-St. Elias Nat’l Park begins. A Must See! A classic “frontier town” building in an area steeped in history. It has been renovated and restored to an early 1900’s Arts and Crafts era décor and re-opened with rooms with private bathrooms and a full service restaurant. 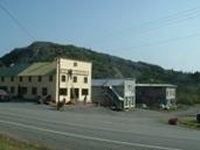 The building is the first in line of three, 2-story structures along the main street in “downtown” Chitina. It is constructed from Douglas Fir by expert craftsman. The nearly century old building has been painstakingly restored to its former glory yet leaving some of the marks of the people from the past. The Gilpatrick's purchased the old hotel and old saloon in the early part of this century and built the addition that hooks the two buildings together. The buildings were re-opened in 2006 for public rest and recreation. 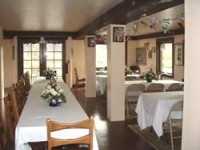 The main floor houses the kitchen, restaurant, lobby, and saloon. The top floor of the building houses the sleeping rooms. The layout is much the same as it was in the 1950's. 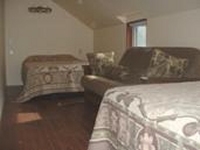 Our rooms are still in the old style...small and cozy. But they have been up-dated to provide private bathrooms and Queen-sized beds. The lower floor has rental showers and will have six more rooms including a handicap accessible room. Whether you’re looking for a quick casual meal or your days dining experience, we can serve you in style in our dining room with its warm ambiance from ages old wood. 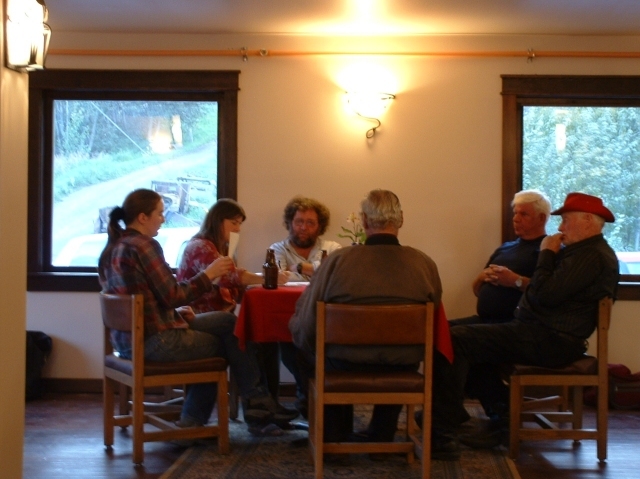 We offer a complete menu for varied tastes and budgets. 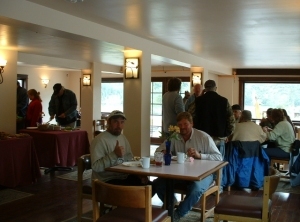 The Restaurant is open from Memorial Day through Labor Day from 7:30am to 9:30pm (closed during shoulder season 1:30pm to 5:30pm). Hours vary during the off season. You can start your day with a full breakfast in our sun-filled dining room or grab a pastry from our bakery case and head off on your adventure. We can also prepare lunches to go for you. For lunch, we offer soups, salads, sandwiches, burgers or maybe just a sweet treat. And of course a relaxing view out our windows or a pause on our decks. After lunch you can stroll thru town, stop in the art gallery, The Emporium, or visit the old stage coach building and take in some history. Dinner is more than just a meal…it’s an event served in courses. It begins with a serving of our house made soup of the day or a salad of crispy fresh greens, and a demi loaf of bread. Then the culinary experience of your chosen entrée. We offer selections from steaks, salmon, rockfish, chicken and pasta. You can have your chosen main dish prepared a variety of ways… blackened with a house made spicy Cajun seasoning; grilled and glazed with a pineapple teriyaki sauce; Oscar style with crab, asparagus, and béarnais or simply grilled with a light seasoning. Whatever your choice…your taste buds are sure to enjoy it. And just when you think that there can’t be any way to top your fantastic meal… we’ll tempt you with our house made delectable desserts! Chitina is located on the edge of Wrangell-St. Elias National Park, the largest, most pristine of our National Parks. 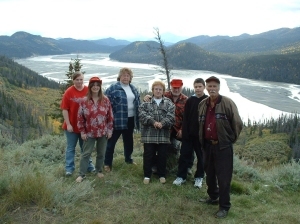 History comes to life as you travel back in time to the boom days of copper mining and gold rushes. Spend a few days in the Alaska you have envisioned. You will find the area accessible but not yet over developed. 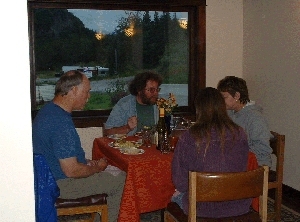 Alaskans sharing Alaska and making your visit a memorable experience that you will cherish for years. Chitina sprang up with a boom from 1908 to 1915. It once boasted that it had the finest accommodations north of Seattle...Breedman’s Hotel Chitina. It was a transportation “hub” connecting the Kennicott copper mine with Seattle smelters via train from Kennicott to Cordova; then barge to Seattle. It also connected to Fairbanks via road. The railroad arrived in 1910 and Chitina thrived until 1938 when the railroad pulled out. It quickly became a ghost town, and eventually even had ‘ghosts’ painted on several of the abandoned buildings. 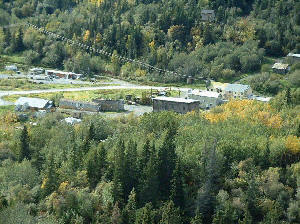 Work is currently underway to have Chitina declared a historical district. It is a treasure trove of old buildings, cars, and stories. Chitina is at the confluence of the Copper and Chitina Rivers. It is a hot spot for Alaskan dip-net fishing for the world re-known Copper River Red Salmon. It is also the gateway to Wrangell-St. Elias National Park which contains five of the ten largest peaks on the North American Continent. The pavement ends at Chitina and the road into the park is gravel and a slow drive; so many choose to overnight in Chitina. 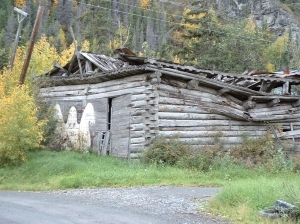 Chitina Ranger Station – for history buffs…located in the old Edward S. Orr stagecoach building it is an historical landmark. 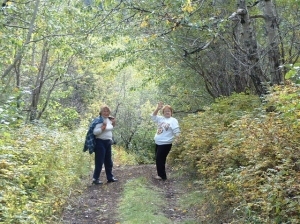 There are also maps of trails for hiking and general info about Wrangell-St. Elias Park and Preserve. Spirit Mountain Art Works – An art gallery full of originals hung in a national historical building right next to the Hotel! 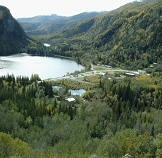 ¨ drive, or take a tour van, to Kennicott and McCarthy stopping at the awesome Kuskulana Bridge and the Gilahina Trestle with Wrangell St. Elias Lodging and Tours or Kennicott Shuttle. All rooms and keys need to be guaranteed with a credit card. Final payment may be made with a traveler’s check with I.D. In state checks with I.D. Out of state checks need to be received two weeks in advance. No show guests are charged full price. 2-13 day advance cancellation receives a voucher for future rental subject to availability, limited to value of original reservation rental, and good for one year from cancellation date. Less than 48 hours cancellation notice is subject to being charged full price. We are not responsible for events beyond our control that may interrupt or delay your travel. We strongly advise that you purchase travel insurance. Check in time is 3 p.m.
We are a non-smoking hotel. $100.00 fine for smoking in rooms. Smoking is allowed in the saloon. 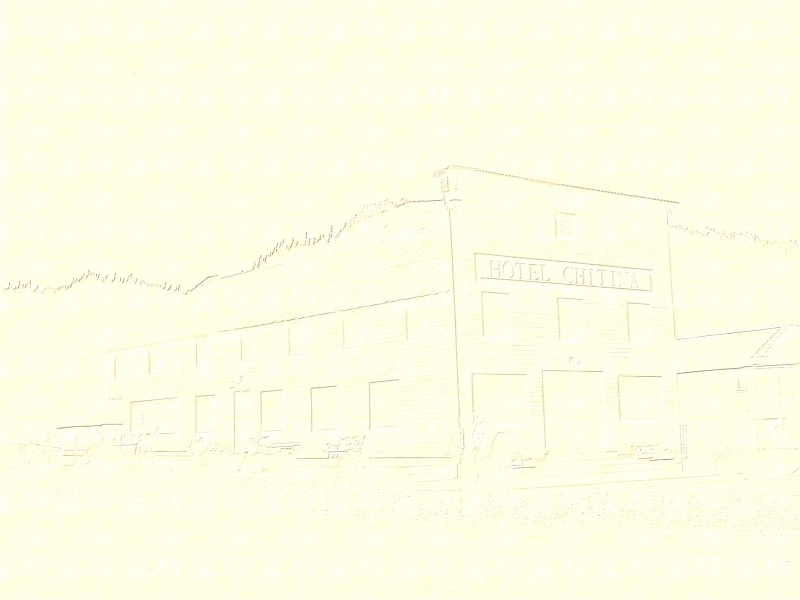 mail: Gilpatrick’s Hotel Chitina, Inc.